Order as a set with ISO 9001:2008 and save! The ISO 9000 family of standards listed below has been developed to assist organizations, of all types and sizes, to implement and operate effective quality management systems. - ISO 9000 describes fundamentals of quality management systems and specifies the terminology for quality management systems. - ISO 9001 specifies requirements for a quality management system where an organization needs to demonstrate its ability to provide products that fulfil customer and applicable regulatory requirements and aims to enhance customer satisfaction. - ISO 9004 provides guidelines that consider both the effectiveness and efficiency of the quality management system. The aim of this standard is improvement of the performance of the organization and satisfaction of customers and other interested parties. 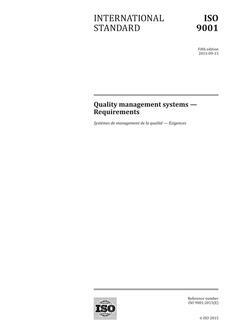 - ISO 19011 provides guidance on auditing quality and environmental management systems. Together they form a coherent set of quality management system standards facilitating mutual understanding in national and international trade. To lead and operate an organization successfully, it is necessary to direct and control it in a systematic and transparent manner. Success can result from implementing and maintaining a management system that is designed to continually improve performance while addressing the needs of all interested parties. Managing an organization encompasses quality management amongst other management disciplines. Eight quality management principles have been identified that can be used by top management in order to lead the organization towards improved performance. a) Customer focus: Organizations depend on their customers and therefore should understand current and future customer needs, should meet customer requirements and strive to exceed customer expectations. b) Leadership: Leaders establish unity of purpose and direction of the organization. They should create and maintain the internal environment in which people can become fully involved in achieving the organization's objectives. c) Involvement of people: People at all levels are the essence of an organization and their full involvement enables their abilities to be used for the organization's benefit. d) Process approach: A desired result is achieved more efficiently when activities and related resources are managed as a process. e) System approach to management: Identifying, understanding and managing interrelated processes as a system contributes to the organization's effectiveness and efficiency in achieving its objectives. f) Continual improvement: Continual improvement of the organization's overall performance should be a permanent objective of the organization. g) Factual approach to decision making: Effective decisions are based on the analysis of data and information. h) Mutually beneficial supplier relationships: An organization and its suppliers are interdependent and a mutually beneficial relationship enhances the ability of both to create value. This International Standard describes fundamentals of quality management systems, which form the subject of the ISO 9000 family, and defines related terms. a) organizations seeking advantage through the implementation of a quality management system; b) organizations seeking confidence from their suppliers that their product requirements will be satisfied; c) users of the products; d) those concerned with a mutual understanding of the terminology used in quality management (e.g. suppliers, customers, regulators); e) those internal or external to the organization who assess the quality management system or audit it for conformity with the requirements of ISO 9001 (e.g. auditors, regulators, certification/registration bodies); f) those internal or external to the organization who give advice or training on the quality management system appropriate to that organization; g) developers of related standards. Quality management systems can assist organizations in enhancing customer satisfaction. Customers require products with characteristics that satisfy their needs and expectations. These needs and expectations are expressed in product specifications and collectively referred to as customer requirements. Customer requirements may be specified contractually by the customer or may be determined by the organization itself. In either case, the customer ultimately determines the acceptability of the product. Because customer needs and expectations are changing, and because of competitive pressures and technical advances, organizations are driven to improve continually their products and processes. The quality management system approach encourages organizations to analyse customer requirements, define the processes that contribute to the achievement of a product which is acceptable to the customer, and keep these processes under control. A quality management system can provide the framework for continual improvement to increase the probability of enhancing customer satisfaction and the satisfaction of other interested parties. It provides confidence to the organization and its customers that it is able to provide products that consistently fulfil requirements. The ISO 9000 family distinguishes between requirements for quality management systems and requirements for products.